kulam onRu: All the souls in this universe belong to only one family that is characterized by being a servant to its eternal master SrIman nArAyaNan. The soul’s true character is to not go haywire by its own likes and dislikes, but being obedient to its master. This character is the inherent nature of a soul and would not change. This family is being referred as “family of servants”. An example would be “thoNdakulaththiluLEr” (thirupallAndu 5). uyir pala: The number of such souls are infinite. These innumerable souls are servants to its master SrIman nArAyanan forever. tham kuRRaththAl itta kalam onRu: These souls live in a container known as “body”. This body is being given to them by sriman nArAyaNan based on the good and bad deeds (karmA) it performs. All such bodies are made of up only one type of material. This material is called as “prakruthi”. So, it can be said that the body is also one, referring to the lone type of material of which it is made of. An analogy to this would be to say that anything that is made of sand is sand at the end of the day. Anything that is made of a precious metal (like ring, necklace, pendant etc.) is still a precious metal. Similarly, anything that is made of prakruthi is still prakruthi. The phrase “tham kuRRathAl itta kalam onRu” is to be construed in this manner by expanding its meaning. The eternal master sriman nArAyaNan gives a body to these souls based on their individual deeds. “kalam” actually means a container but in this context refers to “body”. Since all the bodies are just made of one type of material, it is being described as “kalam onRu”. 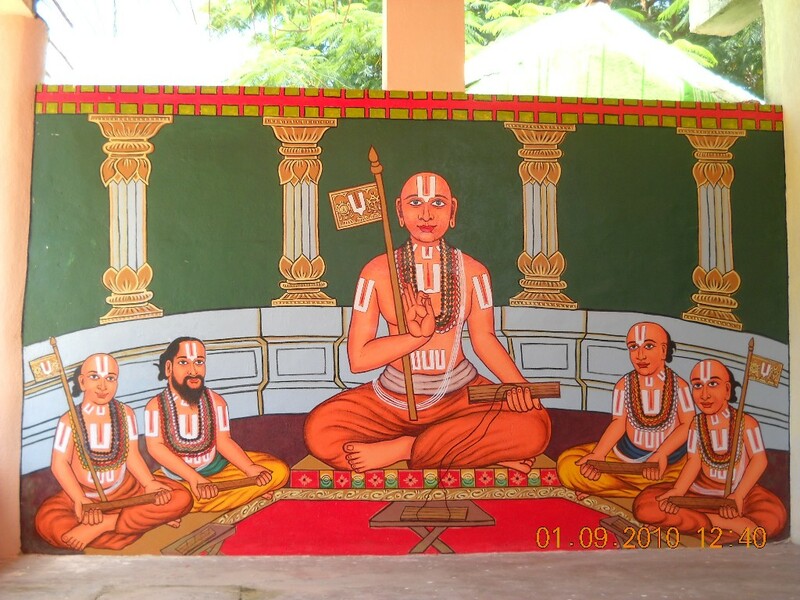 Here nammAzhvAr celebrates the brilliant knowledge of perumAL who gives a body to these innumerable souls without missing / forgetting even the smallest karma that a soul had did in its innumerable lives. kAriyamum vErAm: Similar to the innumerable souls, the activities that these souls do inside a body is also innumerable. While the good activities/deeds would make the soul go to heaven for some time, the bad deeds would take it to hell for some time. At the end of the enjoyment/punishment time in heaven and hell respectively, it is back to the cycle of births and deaths. “vaguththAn vaguththa vagaiyallAl kOdi thoguththArkkum thuythalaridhu” is a thirukkuraL. The subject “vaguththAn” refers to SrIman nArAyaNan who so adeptly calculates the amount of good and bad activities that HE ensure that it is only that particular soul that reaps/risks its deeds. HE does not make the deed transferable to another soul due to HIS ignorance or inability to do it. palam onRu kANAmai kANum karuththAr thiruththAlgaL pENAmai kANum pizhai: The reason is very simple. The mistake is that a soul does not go and catches the lotus feet of an AchAryan. This is being described by the phrase “karuththAr thiruthAlgaL pENAmai kANum pizhai”. An AchAryan is being celebrated as “palam onRu kANamai kANum karuthAr”in this pAsuram. When an AchAryan takes up his disciple, he does not seek any materialistic benefit for himself that includes the likes of fame, money or the capability of having so many sishyAs who serve them as his servants etc. The only thing that he desires is for his sishyAs to go to paramapadham. This is the only thing that he yearns and nothing else. With this, he blesses his sishyAs and teaches all that is needed for the sishyAs to go to the ultimate destination of paramapadham. The act of not taking refuge under the lotus feet of such AchAryan is verily the reason for the never ending cycle of births and deaths. The very look/grace of an AchAryan does a world of good for a soul. One should go to an AchAryan and take refuge under his lotus feet. This would ensure that the kArmic deeds accumulated over eons of births and deaths gets annihilated and so would pave way for liberation eventually. Such greatness of an AchAryan was being described in this pAsuram. “thiruththAlgal pENudhal” would mean the act of catching hold of an AchAryan’s lotus feet. “thiruththAlgal pENAmai” would refer to its opposite, i.e., not holding the lotus feet of an AchAryan. This is the fault (pizhai). We can see this greatness of AchAryan in the SrIvachana bhUshaNam. “bhagavallAbham AcharyanAlE; AchArya lAbham bhagavAnAlE. AchArya sambandham kulaiyAdhE kidandhAl gyAna bhakthi vairAgyangaL uNdAkki koLLalAm. AchArya sambandham kulaindhAl avai (gyAna, bhakti) uNdAnAlum prayOjaNam illai. thAli kidandhAl bhUshaNangaL paNNip pUNalAm. thAli pOnAl bhUshaNangaL ellAm avadhyaththai (a source of curse) viLaikkum. svAbhimAnaththAle Ishvara abhimAnaththaik kulaiththuk koNda ivanukku AchArya abhimAnam ozhiya gathi illai enRu piLLai pala kAlum aruLich cheyyak kettu irukaiyAyirukkum. svasvAthanthriya bhayaththAle bhakthi nazhuviRRu, bhagavadh svAthanthriya bhayaththAle prapaththi nazhuviRRu. AchAryanaiyum thAn paRRum paRRu ahankAra garbhamAgaiyAle kAlangoNdu mOdhiram idumO pAdhi. AchArya abhimAnamE uththArakam” (SrIvachana bhUshaNam 434). SasthrAs talk about bhakthi that promises to take one to paramapadham. More than that there is prapaththi (total surrender) unto the lotus feet of perumAL SrIman nArAyaNan. Both these methods cannot take a person to paramapadham. In such a case, the only option available to a person who has abandoned bhakthi and prapathhi is to catch hold of an AchAryan who is an embodiment of impeccable character. If such an AchAryan regards his disciple by calling him “he is mine”, out of the love he has for his disciple, then there is nothing more a person needs. It can take a person to paramapadham no matter how qualified the disciple is. Hence, the essence of this pAsuram is that those who become the target of an AchAryan’s grace go to paramapadham and those who do not, suffer from this never ending cycle of births and deaths.